McKayla is Not Impressed. She is Delighted! McKayla was not impressed on the podium, she was delighted. At the end of an exciting vault final, where McKayla was really challenged by others, she seemed to drink in the experience while the anthem played. Her eyes sparkled as she smiled a deep smile of contentment and a little giggle. This was a great vault final, opening up with two beautifully executed, stuck vaults from Giulia Steingruber from Sweden. These were the same two vaults Alicia Sacramone won her world title with. Next up Yamilet Pena survived another handspring double front attempt. She did not however, get it to her feet. It is a bit of a mystery. She always looks so upset that she didn’t make it, as if she really thought she had it. Yet we rarely actually see her make it. She falls on her second vault as well. Not a happy camper. Oksana Chusovitina completes two clean vaults with some not so clean landings. But seriously, the fact that she is still competing and making finals is just mind boggling. Phan Thi Ha Thanh followed her with a fall and near knee injury. After her was Chantysh Netteb who fell on her vault and did injure her knee. Her vault was super high and clean, so this was surprising, and so sad. Then the competition heated up with the top three gymnasts all at the end. 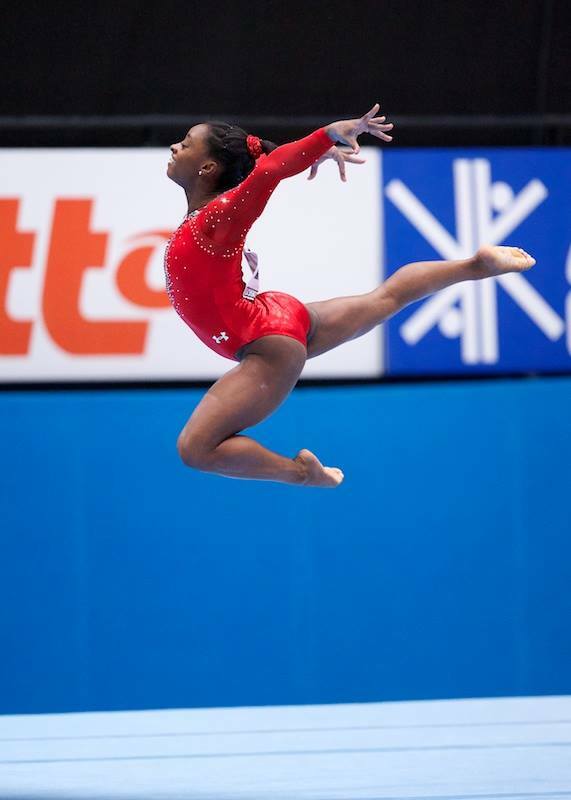 Simone Biles threw a powerful and clean Amanar apart from her ankle cross. Almost sticks it and then has to take a hop back. Her second fault was a thing of beauty. Great height and distance with perfect form! This most definitely put up a huge challenge for McKayla. Next was Hong Un Jong. She had submitted the TTY to be named after her, so speculation was rampant. She hadn’t actually done one in Antwerp, so it seemed unlikely that she would throw it at the finals. If she was going to win gold, she needed to throw it. But she was almost assured a medal if she stuck with her Amanar. And to the relief of American fans everywhere, she stuck with the Amanar. After all, if she competed it, it was not likely to be a great TTY, and it just feels “right” that it should be called a Biles or a Maroney. (Won’t that be interesting if that is determined soley by competition order in prelims next year? How do they decide that?!?). Anyways, Hong did a powerful Amanar with lots of power to spare, but a huge bounding step forward. Not enough to surpass Simone. And as we all assumed it would, in the end it came down to McKayla. But this year, she had to have two great vaults to win. And that she did. She did a gorgeous Amanar that just barely landed out of bounds. And a great second vault as well with just a small step to defend her World title. The American team really has become something special in their bond to each other. A huge hug between McKayla and Simone, lots of laughter and smiles as they walked to the awards podium. What a great pair. Step One on her four year path to Rio and an Olympic vault medal is complete. And done in the ever impressive Maroney style. Here are your 2013 World Uneven Bars Finalists. They will compete in the Saturday morning event finals session, starting at 8:30am. You can watch it here. My predictions for the podium…. The Chinese are without a doubt the leaders. But I just have a feeling they will both fall. I hope not!!! I think Aliya will pull an Aliya… come out super fierce for finals. But this one is pretty wide open. If Yao Jinnan hits, she will win it. Here are your top 8 All Around Finalists. They will be competing Friday, at 2pm EST. You can watch here Live. If you haven’t seen all of their performances, each score is linked to a video of their performance. (McKayla Maroney will not be competing due to the two per country rule). Also, for a taste of what’s to come, check out this playlist (or watch it below) of each of the top five gymnast’s qualifications performances back to back in Olympic order. We have been wondering for many months if it would be a three way race in the USA for the top two coveted all around finals spots at the World Championships, or if Marta would put up two all-arounders and give two others the opportunity to qualify for event finals. She had said after US Nationals that she would be happy to go with the three all-arounder scenario and then take an alternate, but time would tell. When the selection committee selected Brenna Dowell as the fourth member of the World Championship team, it was a little unclear as to what path they were taking. If Brenna perfectly hit her new bar routine, she might have an opportunity to make it to the bar event finals. But Brenna makes more sense as an all around alternate than as an event specialist. Peyton Ernst seemed to have more potential to make it into the beam finals than Brenna did to make it into the bars finals. So the selection of Brenna gave us our first clue that Marta might still be on the three all-arounders path. However, all official standings showed McKayla Maroney competing vault and floor and Brenna competing bars and beam. Yes, we went from predictable to high drama. Isn’t it the American way? It must be mentioned how hard it must be for Brenna Dowell. And I agree. To come all the way to Antwerp and end up not competing is heart-breaking. There have been many cries around the gymternet of how unfair it is because she has worked so hard. And I agree, it must be a heartbreaking experience. But I must admit. I think McKayla has worked incredibly hard for this opportunity as well. Without a doubt, McKayla is the most popular, well spoken, sought out of the Fierce Five. She must have turned down so many opportunities to return to training. She went through three surgeries, an incredible media frenzy and still seemed to return to training better than ever, upgrading on floor and improving astronomically on beam and bars. Here McKayla talks about how very much she loves the sport. Simone Biles comes in with the most difficulty at a 25.1. That is almost a point ahead of McKayla (24.2) and Kyla (24.0). The real test here will be in consistency and in execution. Simone’s career is short, and not one yet that you can identify a pattern. However, US Nationals day 1 is the only time she has yet put 4 for 4 together. She has looked incredible in podium training, and with the proven results of Marta’s training camps, there is no solid reason to believe that she won’t come out and hit routine after routine. That being said, there is nothing that compares to the Olympic experience of McKayla and Kyla. If Simone hits all her routines in prelims, McKayla and Kyla, best friends since they were little girls, will be battling it out for the second all around finals spot. McKayla comes in atleast .2 ahead in difficulty, but will most likely lose out more on beam and bars. On the other hand, Kyla cannot compete with McKayla on vault and floor. In the end, it will come down to stuck landings, legs together, and pointed toes. This will be a competition where every tenth counts. It is ironic, because often the controversy about difficulty vs execution is often about American vs European. But this year, the best execution but lowest difficulty will come from one, if not two of the American’s. The drama has begun to see who will make the top two..
McKayla Maroney is doing all around on the world stage! Marta had said this was the route she might go, but it is really exciting to see McKayla finally have this opportunity. She has worked so hard for it this year. We have seen the 2012 team Olympic vault replayed so many times. Could this one even be better? I know the 10.0 in execution seems to be gone forever. But come on people! Award this kind of brilliance! Bars is not McKayla’s strength. But she does have a nice swing, and this is the tightest form, most well executed routine I have seen her do. She fell on one routine and stuck another, This seems to be a compilation of the two. She shimmies and shakes and and swoons with the best of them. And this vaulter can tumble. Really impressed with both the upgrades and the consistency of McKayla’s floor. McKayla has, in my opinion, become one of the best interviewees in the sport of gymnastics EVER. Well, okay, maybe equal to Alicia Sacramone. But she always has authentic, heartfelt, interesting, non-trained things to say.